The choice of the course. The first part of the journey took place completely in Greek territory, namely: -Olympia, Pyrgos, Patras, Corinth, Megara, Eleusis and Athens. From the Panathinoikon Stadium in the Greek capital, the Flame was conveyed to the port of Turkolimano at Phaleros and thence, by sea, was brought to Italy, at Syracuse, a city founded in 734 B.C. which, like Naxos, may be considered the first Greek colony in Sicily. Following the Sicilian and Calabrian Ionic coast and over to the Tyrhennian coast of the Campania and Lazio regions, the route passed through many of the more famous Greek settlements of Sicily and Magna Grecia:-after Syracuse, Lentini (the ancient city of Leontinoi founded in 829 B.C. ), Naxos, Messina, the straits between Scilla and Cariddus, Reggio Calabria, the river Halex (which according to legend sheltered Hercules), Locri (which in 660 B.C. gave Greece and its peoples a complete first Code of written Laws), Crotone, Sibari, Siri, Metaponto and Taranto, the major centre of Magna Grecia. 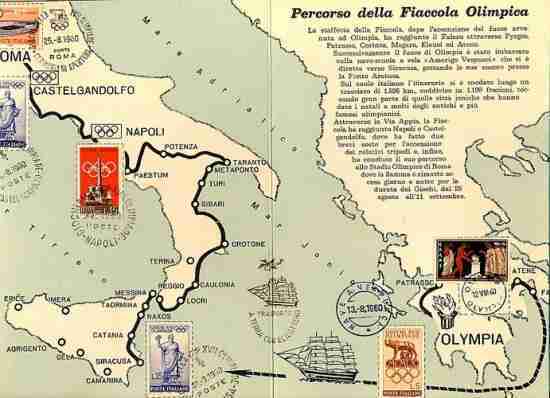 From here, through Matera and Potenza, the Olympic Flame made for ancient Poseidonia on the Tyrhennian sea, Pompei, Herculaneum, Naples and the roads via the Acropolis of Cuma and running beside Lake Averno to Minturno, Terracina and Castelgandolfo. Thus, after so many centuries, the participation of ancient cities in the Olympic Games was ideally renewed, many of which cities had, by their athletes, attained famous victories extolled by poets of ancient times. The last part of the course was chosen amongst historic sites still vibrant with activity today:-the Appian Way, the Forums, the Capitol, and from the Capitol Hill to the Olympic Stadium. The new model of the Torch, whose conception was inspired by Prof. Maiuri from torches reproduced on ancient monuments, was made in bronzed aluminium by the Curtisa Firm of Bologna. The Torch weighs 580 grams and measures 40 cms. in height. During the relay from Syracuse to Rome it was lit with capsules containing special resinous substances produced by the firm of G. Belardini & Figli of Rome. The design is based on drawings of torches on ancient Etruscan ceramics. The new model of the torch. The new model, decidedly classical in line with slim and slightly conical fluting, was built by the firm of Curtisa of Bologna. The torches, placed in appropriate cylindrical boxes, were despatched in rectangular cases containing 6 to 12 models. In December 1959, the Section and the Olympic Torch Committee faced the problem of the emphasis to be placed on all artistic and historical items existing in each area passed by the relay. In January 1960, approval was given to the publication of a treatise which not only summarised and illustrated the technical operations throughout the various sections of the course but also described the intimate significance of the XVII Olympiad. In this respect, direct contact was also established with the Italian Touring Club for the production of a work to be entitled " The Olympic Flame from Greece to Rome ". During this same period, a solution to the problem of transporting the athletes to the various hand-over points of the relay was arrived at and it was decided that the Chairman of the Committee should visit Greece to finalise the arrangements for the Ceremony of handing over the Flame. At 9.30 on the morning of 12th August 1960 the historic ceremony of the kindling of the sacred Flame took place at Olympia. Operations commenced at 9.30 in the Temple of Jupiter. A Greek woman wearing the clothes of an ancient Priestess held a parabolic reflector over the torch and in a few seconds the torch flared. Before proceeding with the kindling of the flame, the Priestess had said a prayer to Jupiter " that the rays of Phoebus should kindle the sacred torch, whose flame, carried across land and sea to the Stadium of Rome, would enlighten the noble competition of the peaceful Games for all peoples of the earth ". The Priestess and the vestals wore ash-grey tunics similar to those in use at the time of the priestesses of the Goddess Hera. On board the " Vespucci ". As soon as the torch was lit, it was placed in a classical Greek vase and carried in procession to the ancient Temple of Hera. Meanwhile, the vestals performed classical dances whilst the Priestess kindled another torch with the flame in the vase and handed it over to the first runner, Penaghoitis Epitropoulos, an athlete who was later to compete in the Decathlon of the Rome Games. The Greek athlete received the torch kneeling and immediately started to run in the direction of Athens. The course of 330 kms was undertaken by a relay organised by the Greek Olympic Committee and passed through Pyrgos, Patras, Corinth, Megara and Eleusis. At 21.00 hrs on the 13th August, the Flame was handed over by H.R.H. Prince Constantine of Greece in the course of a picturesque ceremony to Mr. Piero Oneglio, Vice-President of the C.O.N.I. and representative of the Organising Committee. He, in turn, handed it over to Mr. Aldo Mairano, President of the Olympic Torch Committee who then passed the symbolic Flame to a cadet of the Italian Navy who boarded a Greek whale-boat and crossed over to the harbour of Zeas near Piraeus and brought it aboard the training-ship " Amerigo Vespucci ". At 20.30 hrs on 18th August, the Flame was disembarked at Syracuse and received by the President of the Sicilian Region not far from Fonte Aretusa. From Syracuse, the Relay followed the same course as that followed by the ancient Greeks during the period when they founded their colonies and through those parts whose former prosperity earned them the name of Magna Grecia. Sailing school ship "Amerigo Vespucci"
The itinerary covered 1,532.800 kms in all. The course was divided up into 1,199 fractions, most of them 1,500 metres long, to be covered in a time of 5 mins. 30 secs. Exception was made in the case of uphill stretches where the distance was cut down to 1,000 metres to be run in the same time. The torch-bearers were recruited from amongst the members of sports clubs and schools in the fifteen provinces the Relay passed through. The selection was made after strict training on tracks and roads, particular attention being paid to the selection of those who were to run through towns. All the fractions were covered in the established time. The handing over of the Flame was effected by applying torch to torch, to the accompaniment of great popular enthusiasm which this race aroused. In places where special ceremonies were to be held, namely, Syracuse, Messina (where the Straits were crossed aboard characteristic Messina craft and accompanied by practically the whole of the shipping from that city), Reggio Calabria, Metaponto and Castelgandolfo, use was made of tripods burning fuel lit by the Olympic Torch. Other tripods were used at those points where the Torch remained overnight, i.e. Crotone, Taranto, Potenza, Paestum, S. Maria Capua Vetere, these being closely guarded by young athletes and surrounded by crowds of local townspeople increasing in numbers as day dawned. All the centres along the course witnessed scenes of great enthusiasm on the part of the population as a result of the initiatives taken by the Authorities and sports officials. Colourful spectacular scenes of festivity were the rule at the passage of the Torch. Everywhere flowers, fireworks, the ringing of church bells and thousands of young people wearing the traditional five coloured rings greeted the Flame. Large panels illustrating the various sports, special lighting and a panoply of flags provided exceptional spectacle value doing full justice to the spiritual significance of this event. The organisation for the Province of Rome was encharged to Lt. Col. Francesco Andreotti of the Metropolitan Police Corps. Velletri, 17.43" hrs; Genzano, 18.32'30" hrs; Ariccia, 18.43'15" hrs; Albano 18.5312 " hrs; Castelgandolfo, 19.03' hrs and Rome (Capitol) at 21.00' hrs. Upon arrival at the Capitol, the last athlete of the Relay greeted the crowd, raising the Torch in their direction, and then proceeded to light the tripod which was kept alight until the next day. Thus the great relay came to an end to the sound of a fanfare by the Followers of Vitorchiano. Here the people of Rome enjoyed one of the most colourful ceremonies. Within the framework of the Michelangelo Palaces on the Capitol where Rome in the person of Tarquinius the Proud raised the Temple of Jupiter Optimus Maximus Capitolinus, the Sacred Flame burned throughout the night, whilst the Olympic Flag fluttered on the Capitol tower. The following day, in the presence of the Mayor of the City and numerous representatives from the Government, the Armed Forces and the Organising Committee, the relay took up its course once more and, crossing Rome via the Corso and the Via Flaminia, reached the Olympic Stadium at 17.30 hrs as the Opening Ceremony was taking place.